Anna Cherer (LA ROCHELLE, France) on 27 January 2018 in Landscape & Rural. Typique avec ce toit caractéristique et plantée dans son champ de maïs ! J'aime beaucoup l'image de cette vieille grange au milieu du champs de maïs tu l'as prise depuis la voiture en roulant! Très belle journée et gros bisous! @mo.langel: oui, je l'ai prise en roulant, ( tu l'as vu au premier plan flou ) parce qu'on ne pouvait jamais s'arrêter là où j'aurais aimé en photographier ! Merci, belle journée à toi aussi ! Strange how these old barns make such a statement . . Very pretty layers and composition for this common sight in Ontario and many other Canadian provinces... I love the green of the foreground and this very pleasing sky. Qiuelle ferme et compo quel champs et vue fantastique captage. 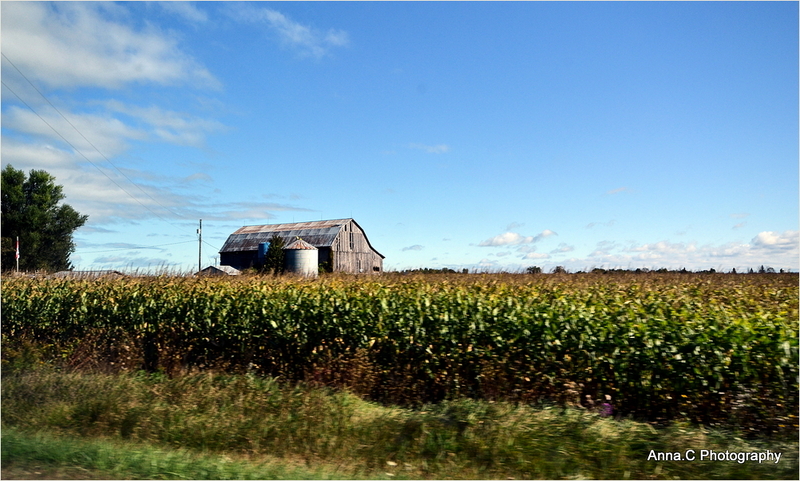 A super image of the barn and field of corn. I like the feel of open space here. It looks like the midwest US where I am originally from. So pretty, so free. I used to work in the fields in the summers back home, Detassling corn. I'm old now, but these are my fondest memories. @Becky: Thank you very much for sharing your youth good memories with us, Becky ! I am very happy of it ! When I was much younger than I'm now, I worked on a farm in Ontario whose barns looked exactly like this! And if the field was a tobacco field and not a corn field I'd be right at home. Thanks for bringing back fond memories with this beautiful image! @franz: Thank you for sharing your good memories and experience with us, Franck! I am very happy that my photo allowed it ! Thank you very much ! There is something so appealing about old barns, especially when surrounded by green fields and pastures. Beautiful. That is a very nice composition with the barn rising out of the field. I like this composition with the tall corn.